The SBRTTA is an association operated in accordance with bylaws independent of the SaddleBrooke Ranch HOA. The bylaws set forth the authority and limitations of our association, specify how we are organized, membership eligibility, Officer positions and their duties, how elections are conducted, financial management and reporting, meetings and other matters. Refer to the bylaws located in our File Cabinet for details. Membership is open to all SBR homeowners, residents, renters and guests meeting the requirements of the SaddleBrooke Ranch Homeowner's Association. Membership shall be maintained providing yearly dues are paid and there are no issues from other players regarding behavior during organized play time. Annual SBRTTA membership dues are $5/year, and are payable by January 31st. Payment method TBD. Be sure to register for email alerts when items are posted on our news feed. When session times change, we will post the information on our news feed. Click the "Get News Alerts by Email" section title for details. The room and table tennis tables can be reserved for times that do not conflict with SBRTTA organized play times and also when not conflicting with other groups reserving the room. Contact the Fitness Center to make reservations. "Loaner" paddles and balls are provided. They are not to be removed from the room. Non-member residents may play with the club during organized play three times without needing to join the club. After that, the person is required to join the club to continue playing with the club. This is provided as a means for persons to determine if they would like to join the club. Members may bring family non-resident visitors to play with the club during organized play times. They are expected to abide by the same rules as members especially regarding taking turns with others when the number of players exceeds capacity. Our play is governed by the International Table Tennis Federation rules. Refer to our File Cabinet for a document containing the relevant section of the ITTF Handbook. The server must announce the score before serving the ball, allowing sufficient time for the opponents to announce corrections before the ball is struck. We are forgiving of illegal serves by new players with respect to the ball being tossed before struck. But we expect players to develop a legal serve to be fair to all players. ITTF rules specify the order of serving for doubles games. Specifically, all serves are from server's right court to receiver's right court (diagonal). According to ITTF rules, when playing 2 out of 3 (or 3 out of 5 and so on), the receiver team swaps position when the fifth point is scored by either team. This is intended to provide fairness regarding server/receiver combinations. The same should be done when playing single games. Alternatively, with agreement of 3/4 of the players in doubles games, the serving order can have the server switch sides between his/her first and second serve throughout the game. This affords better variety of play (right-side to right-side and left-side to left-side serving, and serving to both opponent's players during the game). The receiving team of a ball makes the call as to whether the ball is in or out, or on the correct side of the court (on both the server and receiver ends). Their decision stands. If they are uncertain, the ruling is in favor of the opponents. With love of the game, respect for others, camaraderie , and common sense, everything else will follow. If players are waiting to play, please restrict your use of the table for at most three games (playing two out of three). Depending on how many are waiting, you should shorten your length of play by playing no-ad games, or perhaps play just one game. Players should rotate into and out of games in a manner which gives everyone an equal opportunity to play. Click document titles below to open SBRTTA documents. Register your email address for our news feed to receive an email alert whenever a new item is posted. The email will be delivered in the wee hours of the morning, perfect accompaniment for your morning coffee. Click the button below to open the FeedBurner (the email delivery service) registration window and follow the on-screen instructions. First Tournament of the SBRTTA. Meeting called to order 9:05 AM. Ken Gorman suggesting potential future problems with the number of players and the limited number of tables. Ken made a motion to accept minutes from previous meeting and John Hess seconded. Motion passed. Ken Gorman called the meeting to order at 9:05 AM. Nine members were present including Tom Reuter via telephone. Terrific instructional site with great videos! Get a free membership at PingSkills and roam through the tutorials. Excellent material, with video slow motion really showing how the sites are done. Stay informed about happenings and goings-on by registering for email alerts. If you do, you will receive an email alerting you to a new posting whenever a new item is posted. The alert is issued overnight. Look here for photos and videos of events ranging from association social events to intra-association tournaments to inter-club tournaments. Sign up process described in previous posting is on hold pending decision by club as to whether members want to use it. The experiment worked, but probably most members are not interested in using it. Just show up and play. We are now using a sign up process, initially only for the Tuesday session to prove it out and respond to members comments. If all goes well, we will ... read RSS feed item. 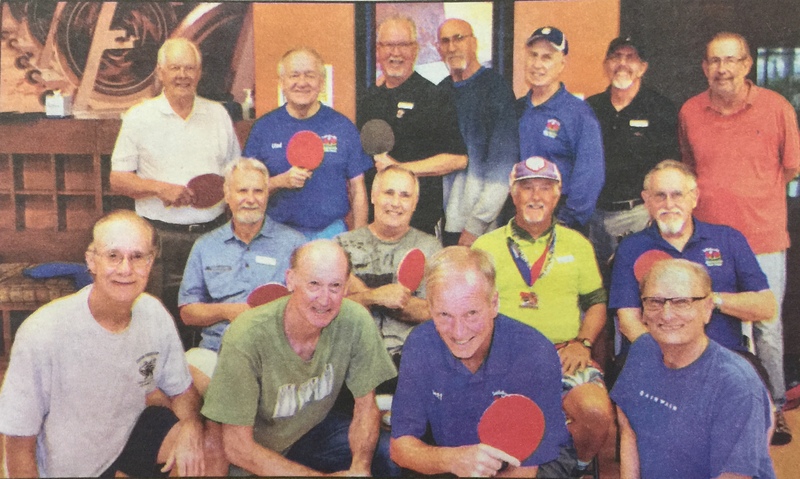 Welcome to SBR Table Tennis News! Subscribe to this feed to receive important news via email about our Table Tennis Club. This is the only way you will be sent the news. We expect all ... read RSS feed item. Welcome to the Home of Saddlebrooke Ranch Clubs. This website (aka "SBR Clubs") is designed and owned by Ken Gorman. The clubs are organized and operated completely independently of the SaddleBrooke Ranch HOA and Robson Communities Inc by resident volunteers. ©2006-2019 by Ken Gorman, RSS Feeds by Enfeedia. "SBR Clubs" and "SBRcloud" are trademarks of Ken Gorman.